Alexa has been with us for some time now. I have been able to play around with it. I currently have 2 Amazon Echo Dots. According to Wikipedia "Alexa is an intelligent personal assistant developed by Amazon.com's Lab126, made popular by the Echo. It is capable of voice interaction, music playback, making to-do lists, setting alarms, streaming podcasts, playing audio books, and providing weather, traffic and other real time information. 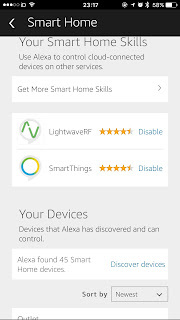 Alexa can also control several smart devices using itself as a home automation hub. Most devices with Alexa allow users to activate the device using a wake-word (such as Echo), other devices require you to push a button in order to activate listening-mode. Currently, interaction and communication with Alexa is only available in English and German." I hope that statement give a quick glance at what this device is really about, and whether it might be for you. There are other voice assistance on the market and the main competitors to Alexa are the Google Home Assistant and Apple's HomeKit. Tables in that link are continuously updated everyday, so the information here is a snapshot of information on that link. What you can do with Alexa? The following is an example list of things that you can say or ask Alexa. "Alexa, whats my day like tomorrow?" "Alexa, tell Lizzy a bedtime story"
"Alexa, who is Michael Jackson?" "Alexa, wake me up at 7 in the morning"
"Alexa, ask Skyscanner for a flight to New York"
"Alexa, ask The Telegraph for the top stories"
"Alexa, shuffle my Favourites playlist"
"Alexa, what's on my calendar today?" "Alexa, what's the weather in London?" "Alexa, play Taylor Swift from Amazon Music"
"Alexa, turn on the coffee machine"
"Alexa, turn on all the lights"
"Alexa, switch on main bedroom lights"
"Alexa, set the master bedroom to 20 degrees"
"Alexa, ask Uber to request a ride"
"Alexa, open Just Eat and ask for my last order"
"Alexa, ask Jamie Oliver for a recipe"
I have 2 Echo dots, One in the living room and the other one in my bedroom. I can use the one in the living room if I am in the Kitchen, provided there is not too much noise (like loud music playing), but it works all the time. The above systems are the key to the success of Alexa in my house. My visitors are always in awe of how I control devices and lights in my house by just using my voice. 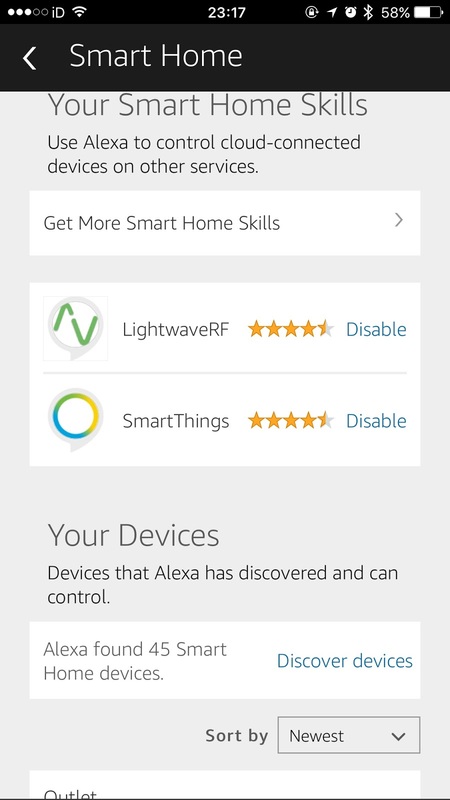 At the moment no other home assistant is compatible with LightwaveRF system, so Alexa is ahead of the game at the moment. If you have any interesting tricks, skills and features that you want to share or discuss, please leave a comment.